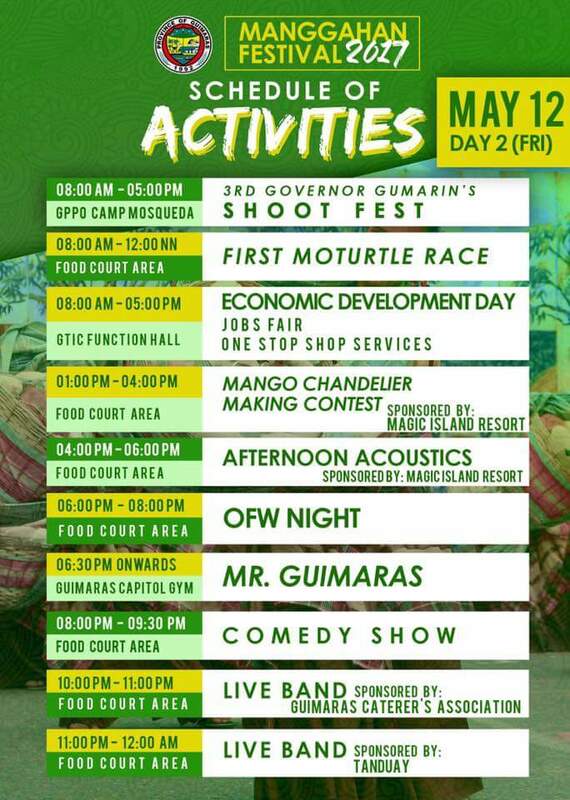 Here are the most awaited activities for the Guimaras Mango Festival (Manggahan Festival) 2017. The preparation for Guimaras Manggahan Festival 2017 is on-going. Stay updated! 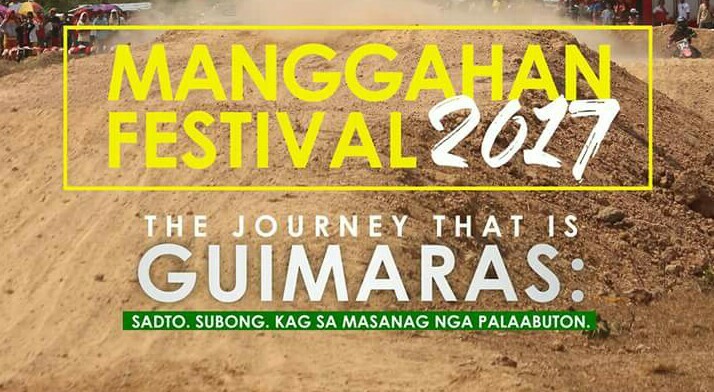 Manggahan Festival 2017 Theme: The Journey that is Guimaras:Subong. Sadto. Kag sa Masanag nga Palaabuton. The Journey that is Guimaras: Today. Yesterday. And to the Brighter Future. 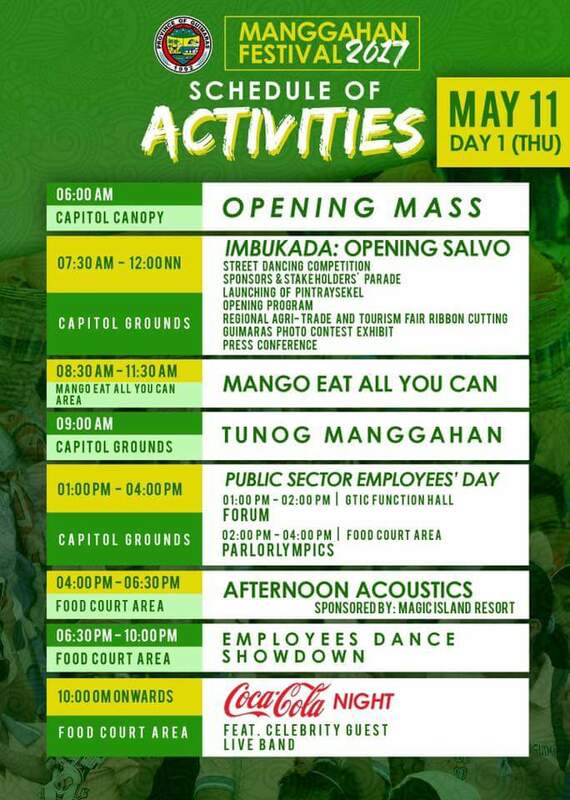 Manggahan Festival 2017 is a two- week celebration which will start on May 11, 2017 and will end on May 22, 2017 at the Capitol Grounds. 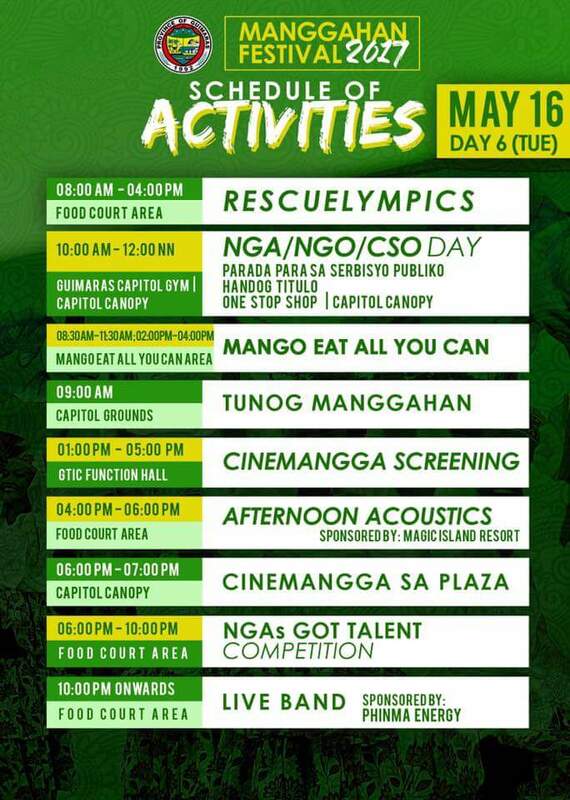 See you in Guimaras and let us, together, Rediscover the Best of Philippines through the celebration of Mangoes in Guimaras. Please update us the schedule so we can plan our trip from davao city. 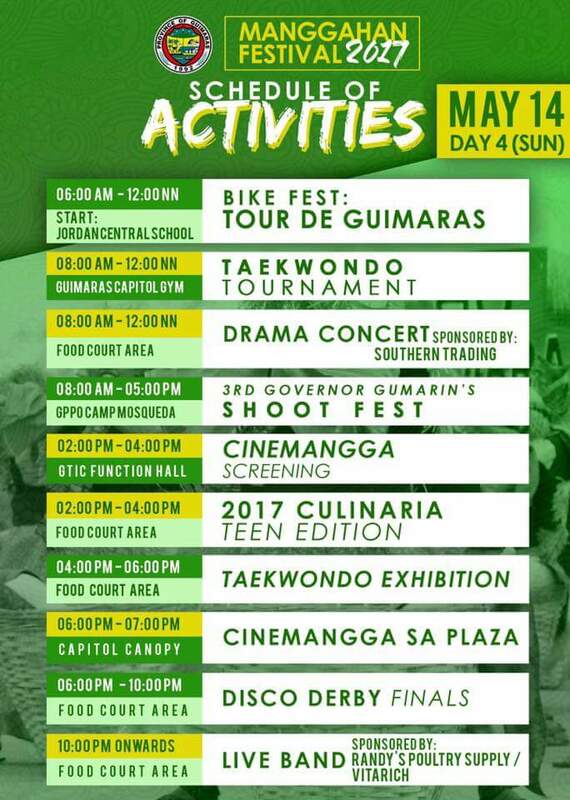 Tentative schedule of Manggahan Festival is on the 3rd week of April to May 2017. We will update this post once the official schedule is released. 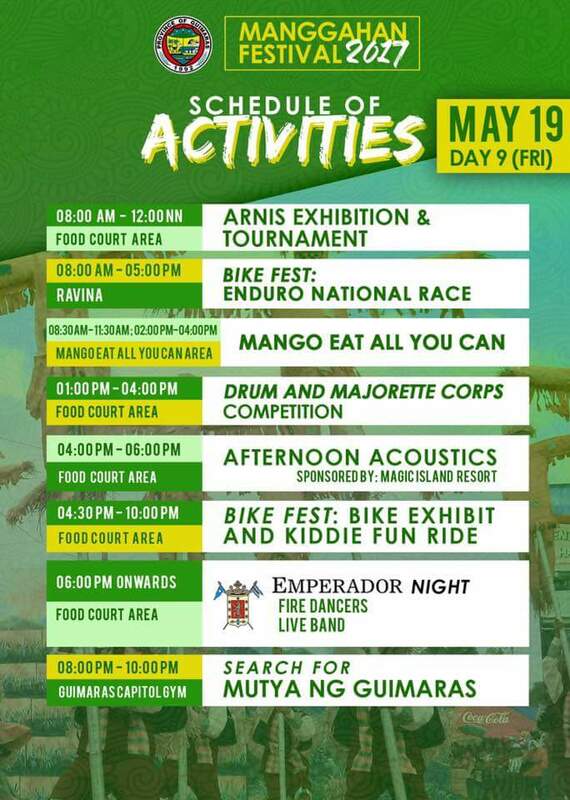 Looking forward to seeing you here in Guimaras and enjoying the Manggahan Festival 2017. 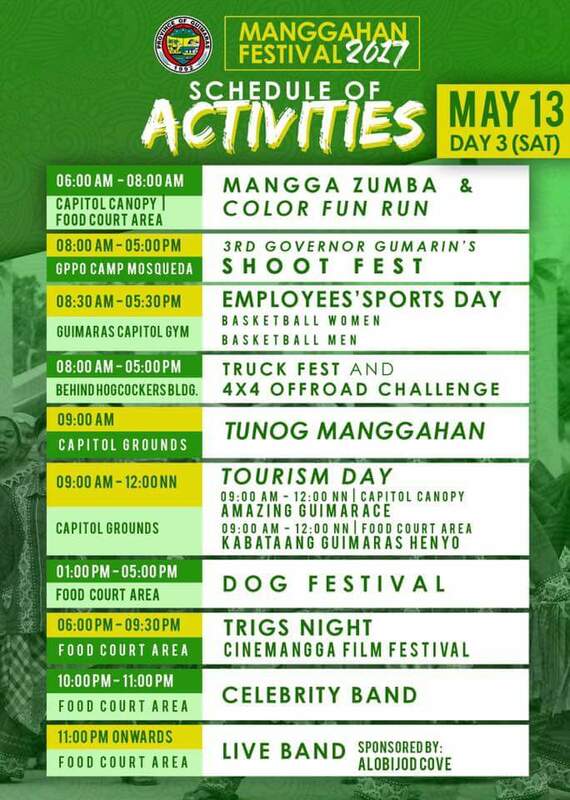 Manggahan Festival 2017 is a two- week celebration which will start on May 11, 2017 and will end on May 22, 2017 at the Capitol Grounds. the main activity is on May 22? Thats right but the fun starts on the 11th. You can book your flights and hotels now. 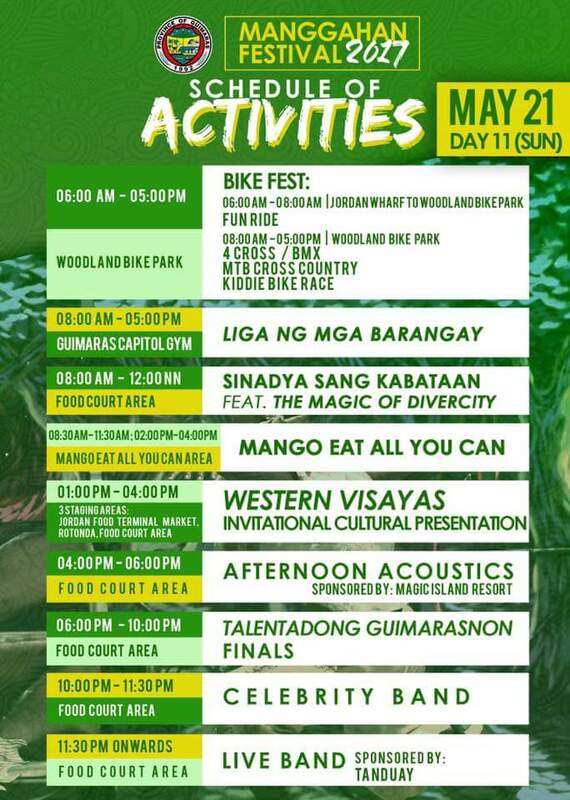 Hope I can experienceManggahan Festival. I haven’t been thre ever since. 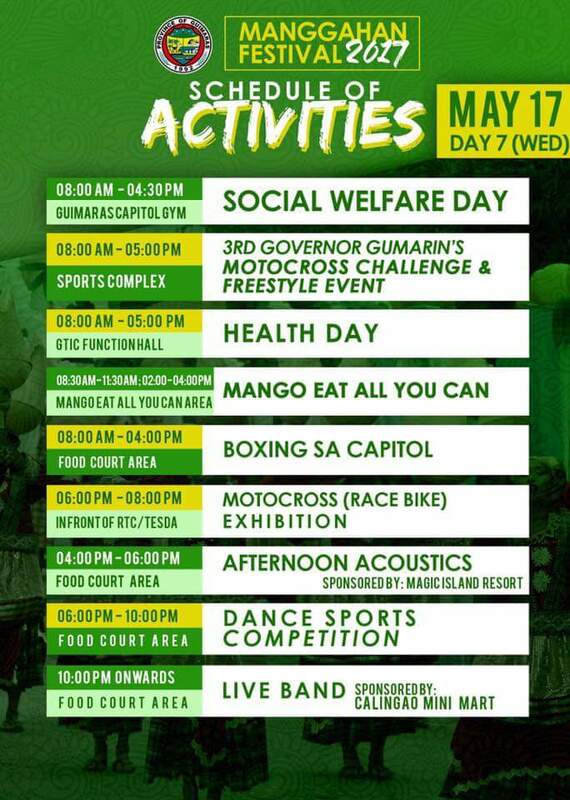 Im sure you wont regret coming and hopefully you could join us as we celebrate the month of mangoes. The beaches are just a plus. You may try the Twin Feathers Inn. Deadline of Submission of entries will be on April 21, 2017. Photo Exhibit will be on May 11, 2017. Hello PO,ask Ko Lang YONG complet address NG event,galing PO NG Iloilo,at meron PO bang registration para mag join Sa event? What event are you looking forward to join? All events are usually held in the Capitol Grounds, San Miguel, Jordan, Guimaras. From Iloilo City, ride a jeepney to Ortiz Wharf, then ride a pumpboat to Jordan Wharf. Ride a public jeepney to the Capitol. Mangkot lang ko tani kung sin.o guest performer mag caravan. Thank you. Anyways. Taga guimaras malang ko. Im not sure about the caravan but Matt Evans and the #HashTags will join the festival. Helow po, how much is the cost for eat all you can mangoes? Hi Veca, I am also excited for your first visit in Guimaras and I hope that we would cross our ways here. Btw, goodluck and have a safe trip for you. Hello! 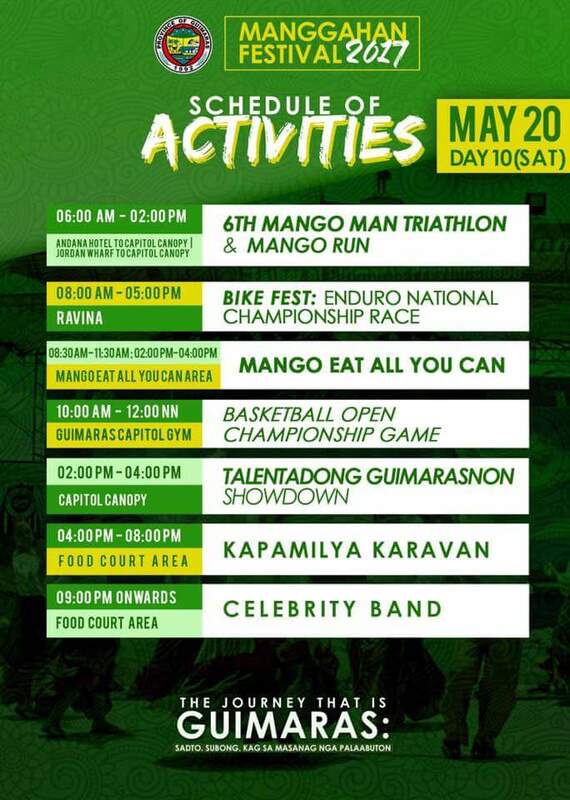 Where pwede ka pa register para sa Mango Run sa May 20? Thanks! Just inquire at the Guimaras Provincial capitol, San Miguel, Jordan, Guimaras. They will be happy to assist you. Hi ! Do you have idea when is the Guimaras Festival for 2018 so that we could include Guimaras in our travel schedule next year.Many thanks! 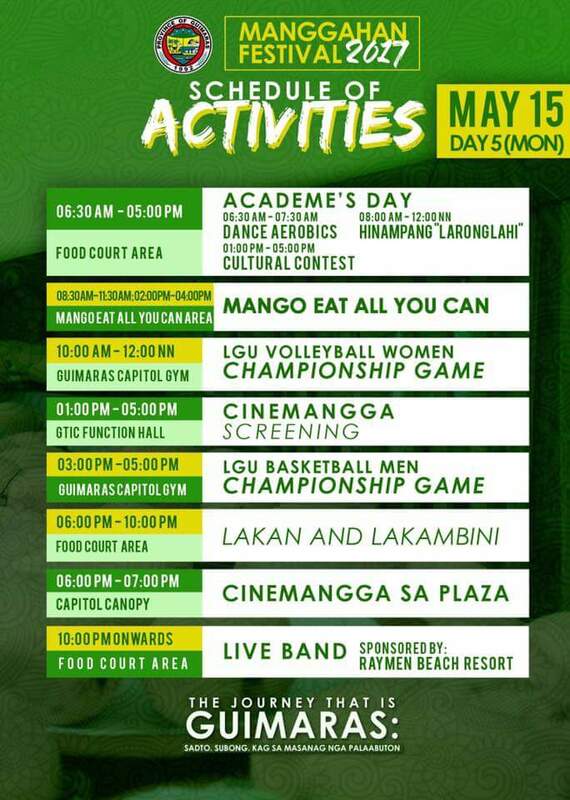 The Manggahan Festival 2017 is not yet finished so the next Manggahan could not be scheduled yet. But it might be in the second week of May 2018 as well. We will keep posting here of any updates. 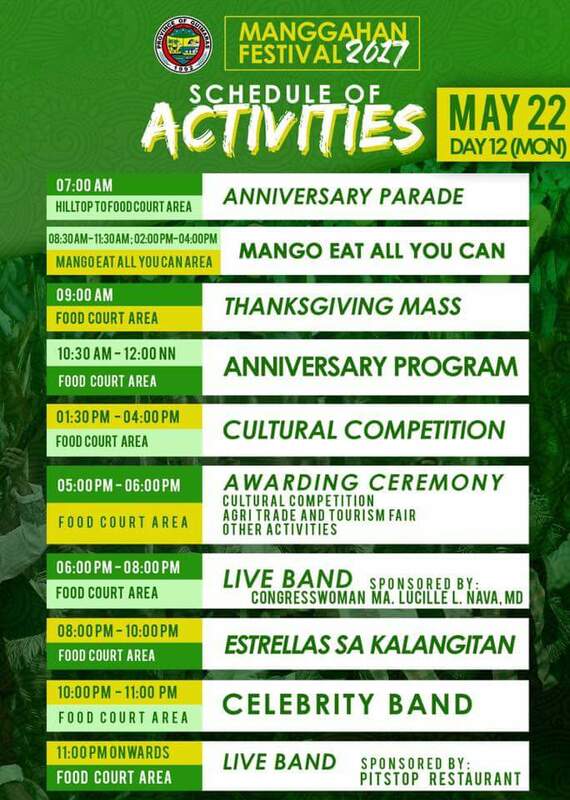 kailan po ang 2018 manggahan festival? we are planing to go there. unscheduled pa po but we will let you know in this site kung kailan ang schedule and any updates. Please subscribe so you will be the first to know. 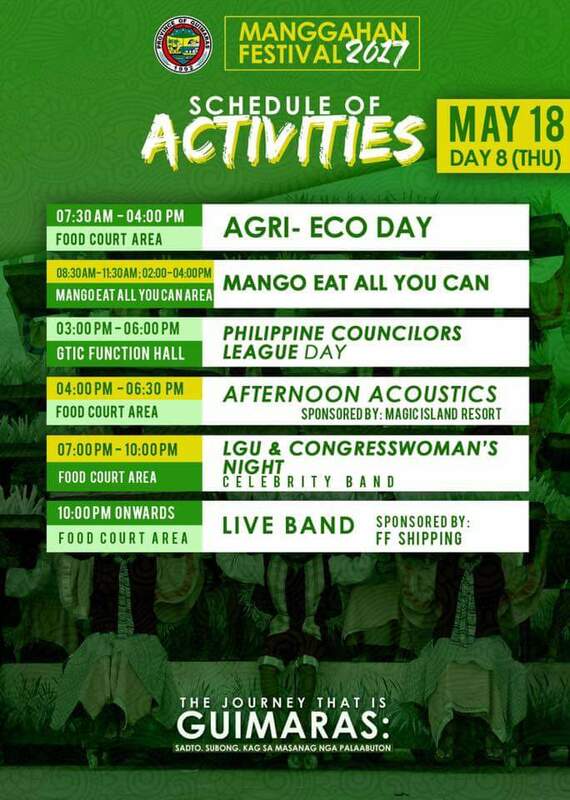 Kelan po ang 2018 manggahan festival ? I want to experience this. Thank you. unscheduled pa po but we will let you know in this site kung kailan ang schedule and any updates.